Standard features of our Monitor Barns include white pine board and batten siding, 2 sliding doors per end of center aisle, Silver Tech roof sheeting, 15 lbs. felt and lifetime architectural shingle roof, 1 sliding door and 1 window per stall, 1 loft door and 1 window on loft gables, 1 window per stall in loft, wood floor, 1 service door and 1 window in tack room, full loft with powder coated ladder , 4 pitch roof over stalls and 6 pitch over loft, oak kickboard 4' high and # 1 T&G SYP on stall fronts with powder coated steel grills. Monitor horse barn measures 30 feet deep by 24 feet long and is built to last with solid wood construction. 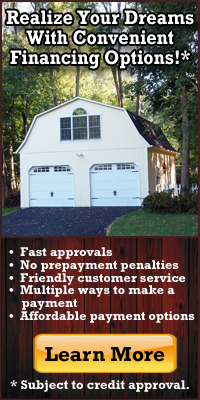 Each horse barn is hand-crafted in the United States by expert Amish woodworkers and available unfinished or with your choice of stain or paint. Asphalt roof shingles are standard or choose an optional metal roof. Additional optional doors and windows are available to meet your specific requirements. Our 30' by 24' horse barn is typically configured as four 10' x 12' stalls with a 10' x 24' center aisle. The model shown in photo measures 32' by 36' with an optional green metal roof, glass with grids on center aisle doors, double hung windows on gable end, B-32 cupola and weather vane. Monitor horse barn measures 36 feet deep by 24 feet long and is built to last with solid wood construction. Each horse barn is hand-crafted in the United States by expert Amish woodworkers and available unfinished or with your choice of stain or paint. Asphalt roof shingles are standard or choose an optional metal roof. Additional optional doors and windows are available to meet your specific requirements. Our 36' by 24' horse barn is typically configured as four 12' x 12' stalls with a 12' x 24' center aisle. Monitor horse barn measures 30 feet deep by 36 feet long and is built to last with solid wood construction. Each horse barn is hand-crafted in the United States by expert Amish woodworkers and available unfinished or with your choice of stain or paint. Asphalt roof shingles are standard or choose an optional metal roof. Additional optional doors and windows are available to meet your specific requirements. Our 30' by 36' horse barn is typically configured as six 10' x 12' stalls with a 10' x 36' center aisle. Monitor horse barn measures 36 feet deep by 36 feet long and is built to last with solid wood construction. Each horse barn is hand-crafted in the United States by expert Amish woodworkers and available unfinished or with your choice of stain or paint. Asphalt roof shingles are standard or choose an optional metal roof. Additional optional doors and windows are available to meet your specific requirements. Our 36' by 36' horse barn is typically configured as six 12' x 12' stalls with a 12' x 36' center aisle. Monitor horse barn measures 30 feet deep by 48 feet long and is built to last with solid wood construction. Each horse barn is hand-crafted in the United States by expert Amish woodworkers and available unfinished or with your choice of stain or paint. Asphalt roof shingles are standard or choose an optional metal roof. Additional optional doors and windows are available to meet your specific requirements. Our 30' by 48' horse barn is typically configured as eight 10' x 12' stalls with a 10' x 48' center aisle. Monitor horse barn measures 36 feet deep by 48 feet long and is built to last with solid wood construction. Each horse barn is hand-crafted in the United States by expert Amish woodworkers and available unfinished or with your choice of stain or paint. Asphalt roof shingles are standard or choose an optional metal roof. Additional optional doors and windows are available to meet your specific requirements. Our 36' by 48' horse barn is typically configured as eight 12' x 12' stalls with a 12' x 48' center aisle.